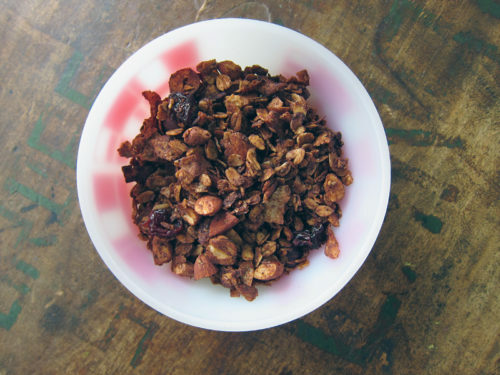 I know, I know, another granola recipe. 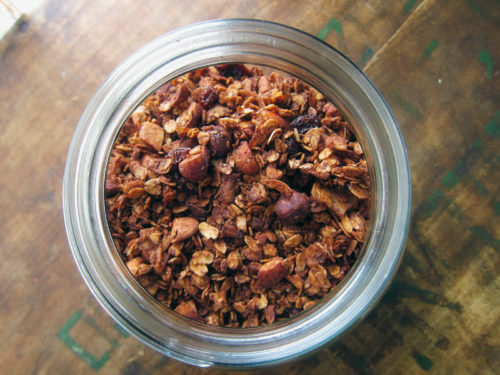 There are a lot of granola recipes on this site already, and this newest addition makes TEN. 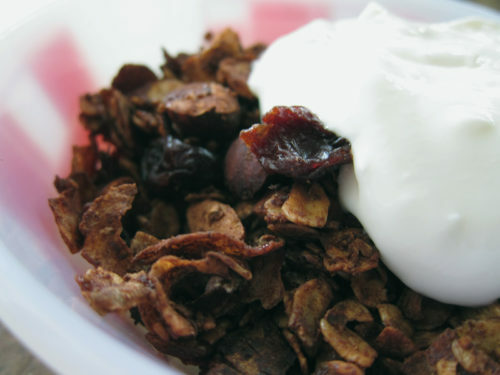 Yup, 10 granola recipes to choose from – not bad really. If you eat granola for breakfast on a weekly (or almost daily) basis, it’s good to shake things up with new recipes. And you’re in luck, because this one is fantastic. Sunday night is granola night making over here in this kitchen. For me it’s a good way to make sure that I’ve got breakfasts covered for the upcoming week and it’s a pretty simple and enjoyable task. Added bonus, it makes your kitchen smell amazing. The cocoa here adds a dark, chocolately richness to the granola, without it being super sweet. You’re not going to fool anyone about this being dessert. It’s breakfast! It’s got chocolate in it! Sounds pretty perfect to me! All the add-ins from the hazelnuts and almonds to the coconut ribbons and dried sour cherries keep on adding up to awesome. There’s lots of crunch and flavour going on. A dollop of greek yogurt, or better yet, coconut yogurt and breakfast is ready. Preheat oven to 300F. Cover 2 baking sheets with parchment paper and set aside. In a large mixing bowl, combine the oats, nuts, coconut, salt and cocoa powder together with a wooden spoon (or if you’re like me, use your hands). Measure the coconut oil into a measuring cup and then pour in the maple syrup, so when you pour everything into the oat mixture, the syrup slides out easily. Give everything a good stir until well mixed (I use a wooden spoon to do the dirty work). Evenly divide the oats onto 2 trays and bake, stirring every 15 minutes or so until evenly done – about 35 minutes in the oven should do it. When the trays come out of the oven, scatter the dried sour cherries over top. Let the mixture cool before packing in tightly sealed jars. This sounds like such a delight! Love it! The hints of nutella flavor are definitely what appeal to me here! Such a great breakfast treat! I love the combination of cocoa and cherries. Sounds delicious. Granola baking in the oven is one of my favourite smells. Sarah, yes, have no fear – this is definitely breakfast-friendly 🙂 Enjoy! Thanks Katrina, it’s a true keeper! Joanne, yes, it’s very nutella-esque! Very tasty. I like how you think, Sues! Yes, Caz, that granola-baking smell is very intoxicating. Hey, there’s nothing wrong with having plenty of granola recipes! That’s the best way not to get sick of granola, right? 🙂 This looks great–such a perfect combination of cherry and coconut. I made this. Stirred after 15 minutes but the oven started smoking at the 27 minute mark. Did you really mean 350F? Most of your other granola recipes are baked at a lower temp. Eileen, agreed! Always need to keep breakfast interesting! Nicole, yes, this is definitely a good one. Enjoy! Robert F – you must be right about that. I didn’t note a different temperature on my handwritten notes, but I wouldn’t have baked it at 350 like the original recipe suggests – I’m too scared of burning granola. I’m so sorry that you smoked yours up – hopefully you got some salvageable bits. I’ve reduced the temp to 300F. > hopefully you got some salvageable bits. No big deal, I just dumped the whole thing into the compost and will try again at some point. Given how much money I’ve saved making all of my own ELS granola, the cost of ingredients is inconsequential. And speaking of money, interesting WSJ article today “The Latest Urban Development Trend: Less Elbow Room” about the Vancouver housing market: spiraling home costs, more buildings on existing lots, etc. Bummer anyway, Robert. 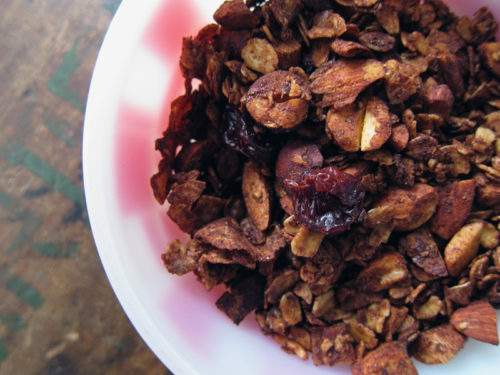 I do hope you try it again – right now it’s my favorite granola recipe. Ah yes, Vancouver’s housing market is what everyone in this city speaks of. I love the idea of laneway houses – there were lots in our old neighbourhood & many of them had been there for decades. I’m glad to see it’s an idea gaining ground, but this city does need to be made more affordable, that’s for sure. Be still my heart, this is a winner! My 6YO and I are granola and chocolate fanatics and this one has it all. I added a lot of flax seed meal and it is super good. Now I am thinking about omitting cherries and putting in peanut butter chips… Thanks, Kickpleat!! You’re a genius! Erin, yes, please do! Thanks for asking 🙂 And I’m so pleased that you love this recipe enough to become a favourite! !